Gospel musician Florence Obinim says too many women are after her husband who is a pastor even though they know he is a married man of nine years. lustfully and the worst part is that this happens right at church” the gospel musician told Showbiz last Sunday. 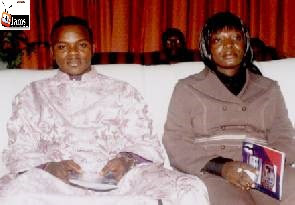 According to the 33 year-old woman, she used to get worried over the situation and even picked quarrels with her husband - Bishop Daniel Obinim, founder and general overseer of international God’s Way Church - at the beginning of their marriage. Now, however, Mrs Obinim says she is no more worried about other women eyeing her husband because she has come to realise they will never put a stop to it no matter what she does. She said it is her husband she will pray in order not to fall victim to any temptation. “I have grown past allowing certain things worry me. I must confess I was having sleepless nights during the initial stage of our marriage because I was afraid of losing him to another woman but now I no longer worry my head because I have grown in the Lord”. Florence Obinim described her man as a wonderful husband. The Osoro Ne Mefie hitmaker told Showbiz that people are often surprised how she has been able to stay with her husband for nine good years despite controversies surrounding him.